Sailing and Powerboat Training - You might get wet! Our increasingly popular 5 day (20 hour) courses are open to all young people during the school holidays. Neptune Sailing has many years experience of providing RYA Youth Scheme courses. 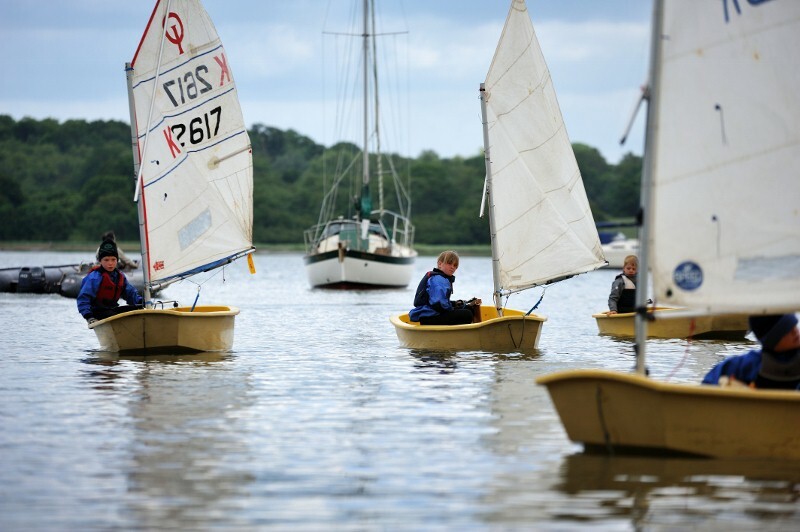 The River Orwell is a challenging environment and safety is the priority for all groups. Our Beginner courses start the week in larger Wayfarer dinghies, working with an instructor in each dinghy. As the week progresses, and students' confidence builds, students are encouraged to try our single-handed craft. We normally find time during the week to cruise up the river to see the sights and often end the week with some fun racing. By the end of the week students should be able to launch and helm a dinghy with some confidence, tacking and gybing in reasonable winds. They will understand what to do in a capsize. They should know the names of parts of a dinghy and will be able to tie some useful knots. The course aims to cover RYA Stages 1 and 2. Students with limited experience of tides will benefit from this course, enabling them to build experience on the river. Stage 1 or 2 awards are made at the end of the week dependent on each individual's progress.